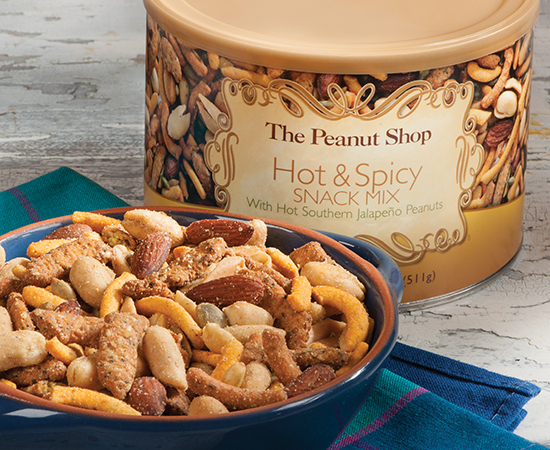 Hot & Spicy Snack Mix with Hot Southern Jalapeno Peanuts, 2-18 oz. Tins. Get ready to fire up your day with our blend of Hot Southern peanuts spiced with jalapeno seasoning, savory snack sticks, roasted almonds, and crunchy pumpkin seeds. A delightful gift for a welcoming host, a great snack by the pool, or popped open after a game. Whatever the occasion, grab a cold beverage and prepare to munch and crunch!